With this guide, we’ll show you through mobile tethering - how to get yourself connected to your device and what to look out for. With more and more people getting connected on the go, understanding 4G mobile broadband and what you can use it for is an essential part of owning smart devices in 2018. With this guide, we’ll show you through mobile tethering - how to get yourself connected to your device and what to look out for. What does mobile tethering mean? Mobile tethering means using a mobile to connect another device to the internet. The original web-connected device acts as a mobile hotspot for other devices. Modern smartphones will feature an option that allows your phone to be used as one of these mobile hotspots. This essentially means that your phone can be used as a Wi-Fi signal that another device can latch onto. Using 4G, you can connect your laptop, tablet or another smart device to your phone and get connected to the internet if no other Wi-Fi source is available. Tethering data is the use of one device's data allowance by another device. When you use your phone as a mobile hotspot it means your data is accounting for downloads on all tethered devices. if you have a very small data allowance each month it might be a good idea to keep tethering to a minimum. If you plan on using your device regularly as a hotspot you might want to look at your monthly allowance on your current plan, and check out our guide on how much data you need. How does mobile tethering work? Mobile tethering uses your smartphone’s 4G connection in order to broadcast a signal that another device can latch onto. This device will then use your phone’s 4G connection to allow you to browse the web, check emails or anything else you would normally do online. Be warned though - using your phone for tethering will use any 4G data you have on your plan in the same way it would if you were browsing on the phone. This means that if you have 4GB of data left, for example, you’d only be able to use 4G worth of data when tethering. Why would I need to use mobile tethering? Mobile tethering is handy in a number of circumstances. It’s ideal if you want to use your laptop for work when out and about or commuting as well as downloading an ebook onto a Kindle or other smart device. Many people can do all this directly on their phones, but tethering to your laptop is helpful if you want to get some proper work done. Mobile tethering is good as a backup if your home broadband goes down and you need to access the internet, though this is only viable as a last resort. You can also use your phone to tether to another phone, allowing you to help a friend who’s run out of 4G data. If you have an iPhone, setting up mobile tethering is a simple process. All you need to do is open the Settings app and toggle on Personal Hotspot. The phone will then give you a password that you’ll need to connect to the mobile broadband. iPhone will give you the option of tethering your phone via both Bluetooth and USB. 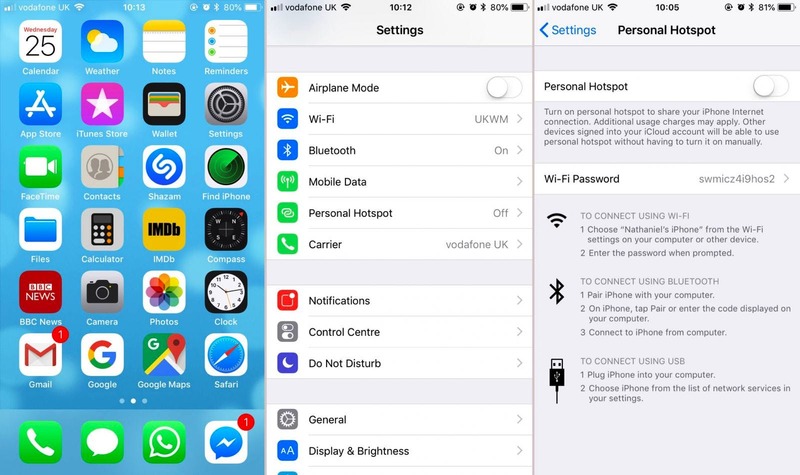 Then, choose your iPhone from the list of Wi-Fi networks and connect. Setting up mobile tethering with an Android device is just as easy as using an iPhone. 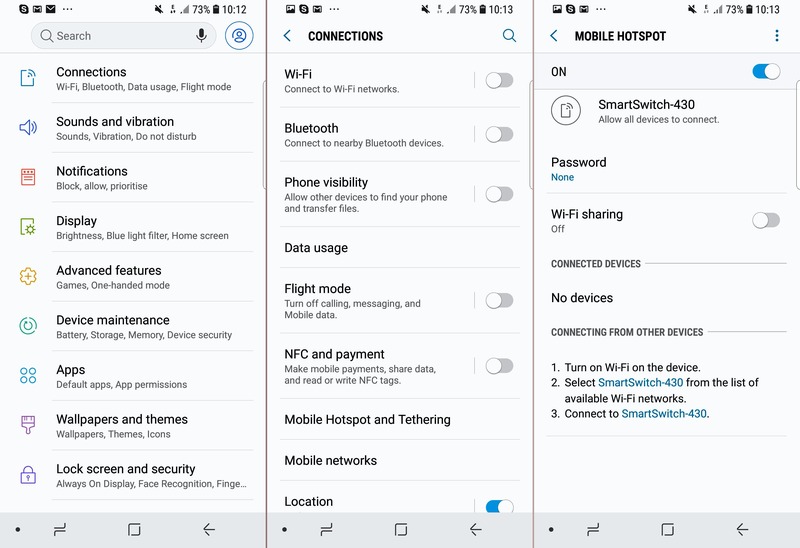 Open the Settings app, then Connections, and you’ll find the Mobile Hotspot and Tethering option. Once you've turned it on there will be an option in the notification bar for setting it up. You’ll be able to choose a password, see connected devices and turn on SmartSwitch, which allows all devices to connect. How much mobile tethering costs will depend on how much you use it and what type of 4G plan you’re on. Using mobile tethering will deplete your data in the same way as if you were using your phone outright, so you need to be careful when tethering. Going over your data limit can incur harsh charges from your phone provider, making mobile tethering more worthwhile if you have a large or even unlimited plan. Don’t attempt mobile tethering if you have 1GB of data a month to spare. Does it affect battery life? Mobile tethering will indeed affect battery life, just like using your phone normally would. This is another aspect of tethering that you’ll need to be wary of when using it, as you don’t want to be left with a dead phone if you’re on a long trip. Luckily, many of the places you’ll be using mobile tethering, such as trains or airports, now feature charging ports and sockets, allowing you to charge your devices on the go. If using your phone’s 4G data plan doesn’t appeal to you or if you have a plan that makes it impossible, you may want to try a dedicated mobile broadband device. These are available from providers such as EE and allow you to bring your own mobile hotspot on a trip without using your phone’s data or battery. Mobile broadband usually offers one-off month-long contracts as well as longer plans for those who use it more often. Mobile broadband devices come in the form of dongles you can plug into a computer and larger devices that can provide mobile broadband to more than one phone or laptop.